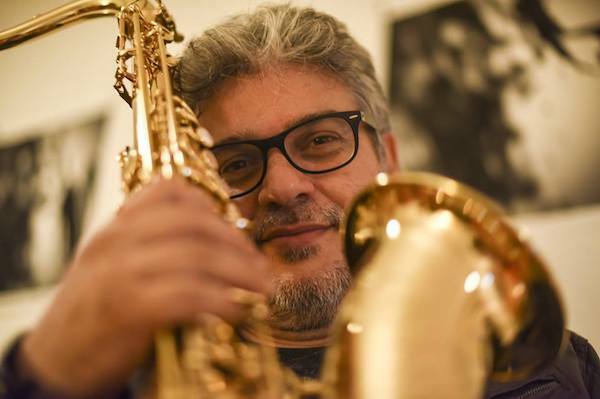 Sérgio Galvão is one of the most in demand Brazilian musicians since the mid-1980 ́s when he moved from his hometown Brasília to Rio de Janeiro. Along these almost 30 years, Galvão has played and recorded with many of the most important Brazilian artists such as Rosa Passos, Simone, Roberto Menescal, Guinga, Roberto Carlos, Dori Caymmi, Djavan, Ed Motta, Jorge Benjor, Seu Jorge, Little Joy, Leny Andrade, Leila Pinheiro, Beto Guedes, Orquestra Imperial, among many others. Moacyr Santos and Baden Powell. Phantom Fish was produced by Brazilian bassist Amanda Ruzza who currently lives in NYC and featured Claudio Roditi, Leni Stern, Chris Stover, Leo Genovese, Aruan Ortiz, Mauricio Zottarelli and Alex Nolan. To complete this work of art, the album was mixed and mastered by the Grammy Awarded Dave Darlington. This global set of contributors in an environment like New York brought to the album a very peculiar and powerful identity crafted by all the color and passion from the Latin Jazz combined with the robustness and strength from the American Jazz. The album was widely praised by the critics and audience and was also prenominated to the Grammy Awards 2014 in two categories: Best Latin Jazz Album and Best Improvised Jazz Solo (for the solos from the tracks “Amphybious” and “Phantom Fish”). On the radio, Phantom Fish joined the lineup of over 160 stations in the U.S and reached a prime position among the Top 115 albums in 2013. The past couple of years have been really special for Sérgio Galvão. After consolidating himself as one of the main Brazilian jazz artists in the American scene, Galvão has toured in both East and West coasts in America, through cities like New York, New Jersey, San Francisco, Oakland, Anaheim, and through legendary venues as the Blue Note and the Shape Shifter in New York. Back to Brazil, Sérgio has been touring all over Brazil with great Brazilian musicians such as Gilson Peranzzetta, Ricardo Silveira, Lula Galvão, Bruno Aguilar and Kiko Freitas, as well as r!ecording many TV and radio shows. Sérgio Galvão Band at Terraza 7. Saturday October 22nd, 2016 at 9:30 pm. No Replies to "Sérgio Galvão Band"